I’m not really a fan of Tarzan, though when I was a kid there was a TV show on with him I used to like to watch. Ron Ely played Tarzan. And I liked Greystoke: The Legend Of Tarzan, Lord Of The Apes (1984). What got me to want to see this new entry in the Tarzan mythology was during the summer I read a review that said it was the most faithful to the books Edgar Rice Burroughs wrote. That had me intrigued. That meant that series and that ’84 movie weren’t all that accurate. The show I could understand, but I had always thought Greystoke was the last word on Tarzan. Looks like it wasn’t and I wondered how Burroughs actually envisioned him now. It’s not a bad flick. Not a keeper in my opinion. For me it was worth a one time watch, but that’s all. 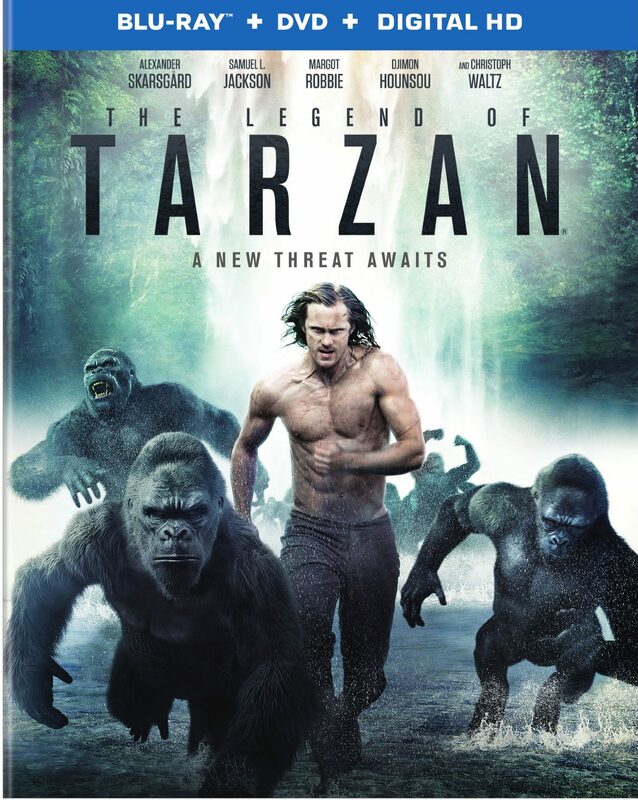 As I understand it the movie under performed this summer anyway, which means this is probably the only big budget Tarzan flick we’ll be kidding for the foreseeable future. What I liked about the movie was how they wove in his origin story. It’s the first summer tent pole Tarzan flick of the 21st Century, which means it needs to be an origin tale of a sorts, and we all know how Tarzan came about, but what they did was start the flick off with Tarzan, aka John Clayton (Alexander Skarsgård) already an established legend down in Africa. But he’s back home in England living a somewhat happy life with his wife, Jane (Margot Robbie). There’s trouble, though, a brewin’ in his home land. King Leopold is using slave labor and accruing an army to take over the entire continent. But this needs to be verified and George Williams (Samuel L. Jackson), a veteran of the Civil War, talks John into going down there with him to see if all this is really happening. John reluctantly agrees and more reluctantly agrees to take Jane along. This is all a set-up by a Captain Leon Rom (Christoph Waltz) working for King Leopold, who has made an agreement with the Leopard Men Of Opar to capture Tarzan and deliver him to Chief Mbonga (Djimon Hounsou) who wants to kill him and maybe eat him. Its revenge for Tarzan having killed his only son when he was young, but that was only done in revenge for his son having killed young Tarzan’s adoptive ape mother. What was kind of ingenuous by the filmmakers was to weave Tarzan’s origin tale into what is essentially a sequel, weaving in all the crucial points in flashback throughout the film. We see how he came to be in the jungle with his human parents, how they died and he was adopted by these apes, how he was raised and hated by some of the apes, how he met Jane and fell in love with her, and how he ended up killing that Chief’s son. The confrontation with that Chief did not go as I expected, another plus for the movie. And I have to admit until last night I had no idea Sam Jackson was in this. Oh, I had seen the trailer and the plethora of TV commercials, but I just didn’t realize it was him until last night. Something about his hair, I think. It was modeled after that time period and I guess it threw me. Anyhow it was a pleasant surprise. I like Sam Jackson. Of course, though, all the animal scenes are CGI creations; in fact most of this movie, as with most of these “summer popcorn flicks,” was made in the computer. I know I sometimes give CGI a tough time, but in this case you really would need to make CGI animals for Tarzan to really interact with for it to be a true Tarzan movie. The problem with CGI though is it gives most of these movies an artificial vibe. I mean when I saw Tarzan swinging through the jungle on his vines, I couldn’t help thinking of the Spider-Man movies. Even though I don’t plan to add it to my collection, it was an interesting night’s diversion. Back on October 11th Warner Home Video released The Legend Of Tarzan on separate Blu-ray/DVD/Digital Copy, 3D Blu-ray/Blu-ray/DVD/Digital Copy, solo DVD, and 4K UltraHD/Blu-ray/Digital Copy editions! Gallery | This entry was posted in The Legend Of Tarzan (2016) DVD/Blu-ray/Digital Copy Combo. Bookmark the permalink.